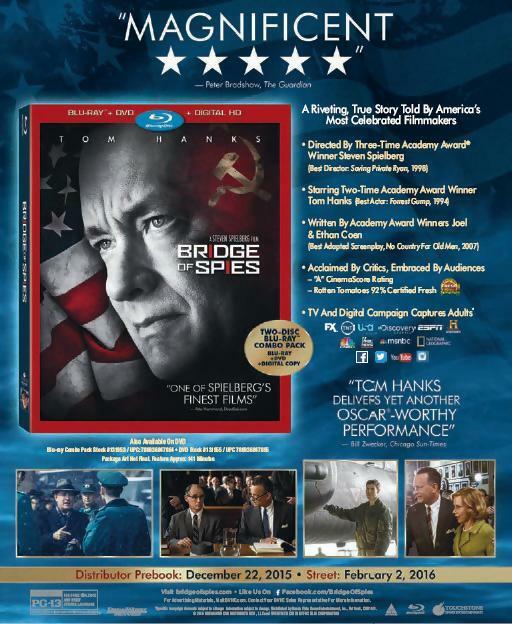 Buena Vista Home Entertainment will release on Blu-ray Steven Spielberg's latest film Bridge of Spies (2015), starring Tom Hanks, Alan Alda, Mark Rylance, and Billy Magnussen. The release will be available for purchase on February 2, 2016. "Berlin 1961: Re-creating The Divide" - Experience the Berlin Wall, Checkpoint Charlie and Frederic Pryor's arrest through a mix of archival imagery, behind-the-scenes moments and firsthand accounts. "U-2 Spy Plane" - Witness the making of the spectacular U-2 plane crash sequence with archival voiceover by U-2 pilot Francis Gary Powers, and a cameo by his son, Francis Gary Powers, Jr.
"Spy Swap: Looking Back On The Final Act" - Relive a page of Cold War history on the Glienicke Bridge while shooting the historic exchange of Soviet spy Rudolf Abel and U-2 pilot Francis Gary Powers. "A Case Of The Cold War: Bridge of Spies" - Delve deeper into the film's characters and the real-life people on whom they're based, and discover why the history behind "Bridge Of Spies" still resonates today.